The ground begins to overheat in the large caldera. Melting the asphalt is very visible in this picture. 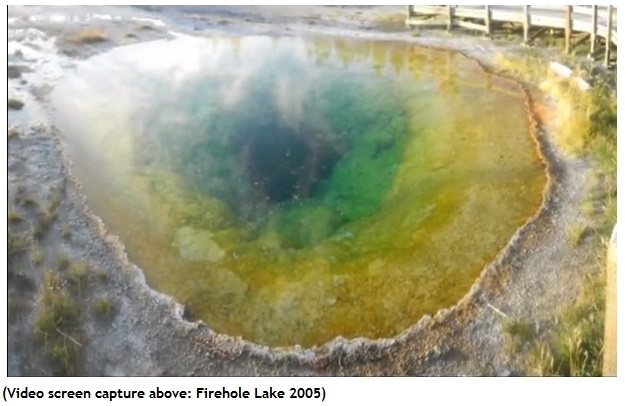 CHEYENNE, Wyoming (AP) – The geology heat evolving from Yellowstone National Park has created a hot spot that melts a paved road and gated access to popular attractions and the height of the tourist season geysers, indicated officials Thursday, July 10, 2014. 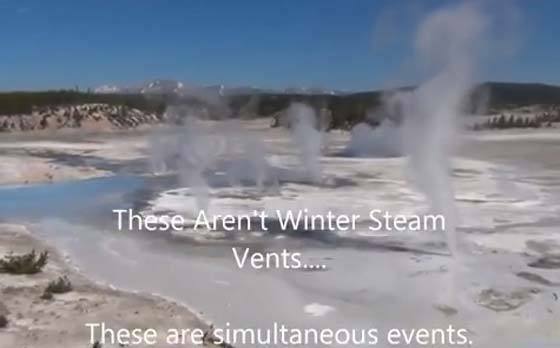 As they examined all possible solutions, park officials have warned visitors not to go hiking in the affected area, where the danger of walking through the solid ground, like watching boiling water was high. 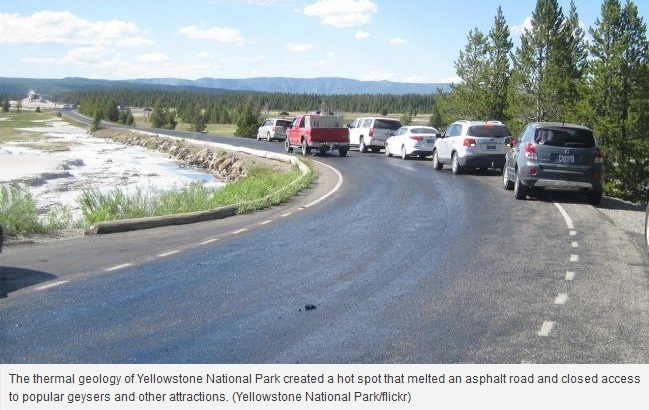 « Naturally, » say officials, changes in current thermal characteristics will often damage roads and sidewalks Yellowstone. The steaming potholes in asphalt roads and parking – defined by traffic cones – are fairly common sights. There is Firehole Lake in 2005. …and now ,there is his actual aspect. However, damage to Firehole Lake Drive are particularly serious and may take several days to fix everything. 3.3 mile loop six miles north of Old Faithful, is the road that takes visitors to see the Great Fountain Geyser, White Dome Geyser and Firehole lake. 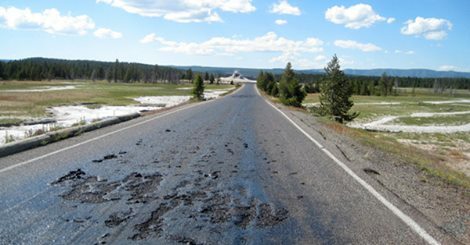 The weather is unseasonably warm for Yellowstone – with high in the mid-80s temperatures – has helped transform the road in a warm, sticky mess. « We have some ideas. We’ll try. Our maintenance staff really looked at the issue, » said Nash … which clearly seeks to reassure us. 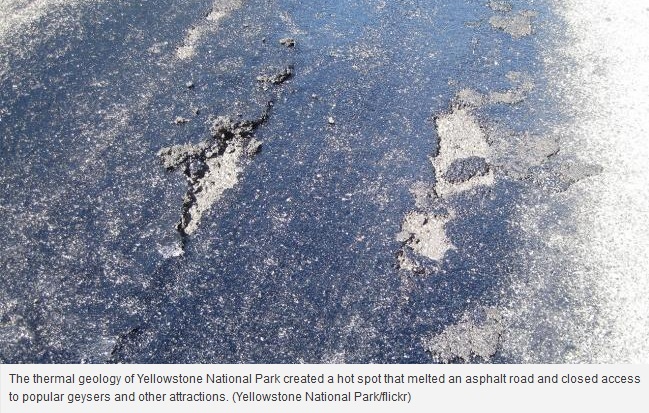 The road was badly damaged by the extreme heat in Yellowstone National Park, forcing park officials to close access. The Firehole Lake Drive area looks like this: a fusion of heat. Park officials said in a press release that the extreme heat of the surrounding temperature zones caused as a thick oil bubbles rising to the surface, damaging the bitumen and creating dangerous driving conditions on the popular and picturesque road near the Grand Loop road halfway between Old Faithful and Madison Junction in lower Geyser Basin park. 3.3 mile loop usually takes visitors to Great Fountain Geyser (Great Faithfull), White Dome Geyser and Firehole Lake. A date for the reopening of the road has not been announced. The report helped the renewed rumors that the Yellowstone caldera, known as Volcano Yellowstone supervolcano or, soon burst ignition. Tom Lupshu, a well-known blogger conspiracy that runs the Bunker report just posted a new video claiming that the volcano could explode soon. This report and the report on the road KTVQ press release has been highlighted by the site of the conspiracy before it’s news. « Update! 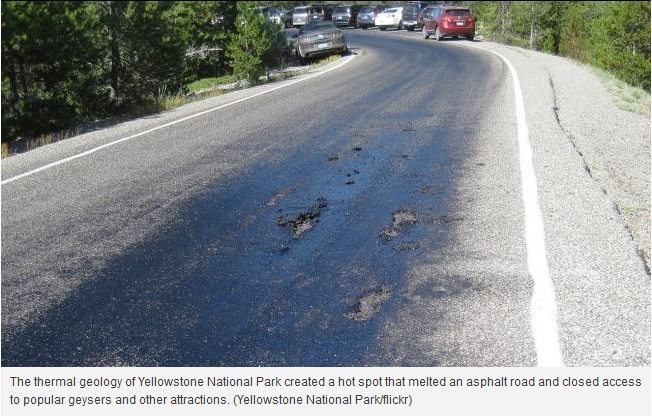 Melts road to Yellowstone National Park, causing the closure » He said in his usual sensationalist style. Renewed speculation following a cycle that exploded in March, after a video was posted showing animals fled to the park as a « warning » that the volcano was about to erupt. 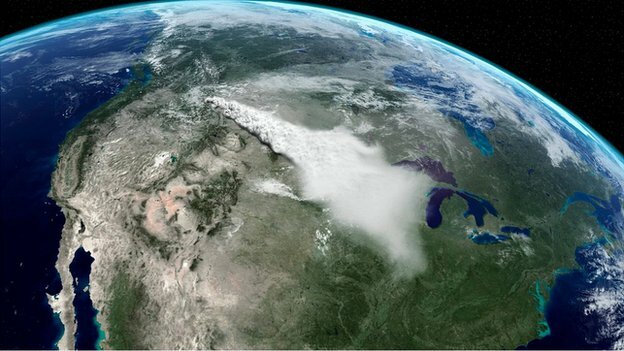 The last major eruption is thought to have occurred about 640,000 years ago and sent ash across North America. 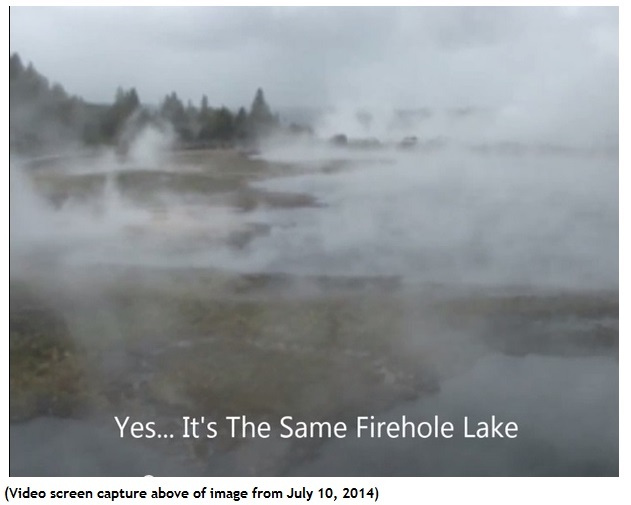 Bob Smith of the University of Utah said researchers do not know when the supervolcano could erupt again. Two further eruptions occurred, there is a 2.1 million years, and there are 1.3 million more years, Smith said. One theory is that the eruptions occur there every 700,000 years, but Smith said that more data are needed to safeguard this theory … until further notice! 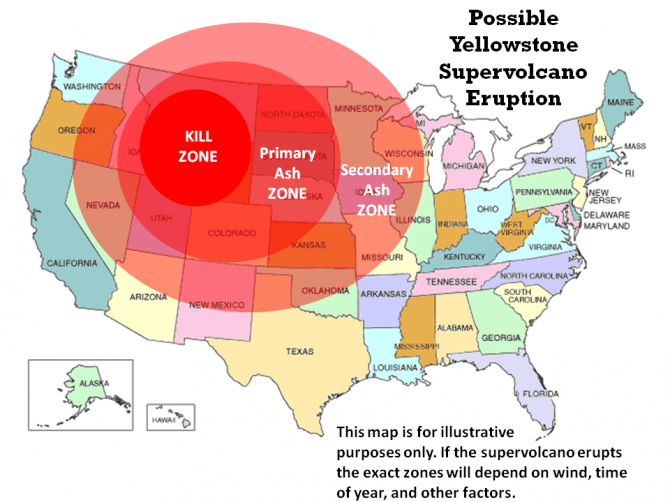 The death zone …around Yellowstone. Map of the study of Russian scientists: a large magnetic anomaly on the American West Coast (orange yellow). A grim report prepared by the Commander in Chief of the Russian Air Force, Lieutenant-General Viktor Bondarev on scientific mission which had just completed over North America mission carried out by four Tupolev Tu-95, strategic airlift and 2 Ilyushin Il-78 tankers that « by electronic scanning » for « magnetic anomalies » from Alaska to California, warns that a « catastrophic event » can be almost for this region. U.S. officials, it should be noted, described the mission as a purely scientific « bombing run » that came within 50 miles of California, but their air forces were able to push with the launch of the F-15 combat. 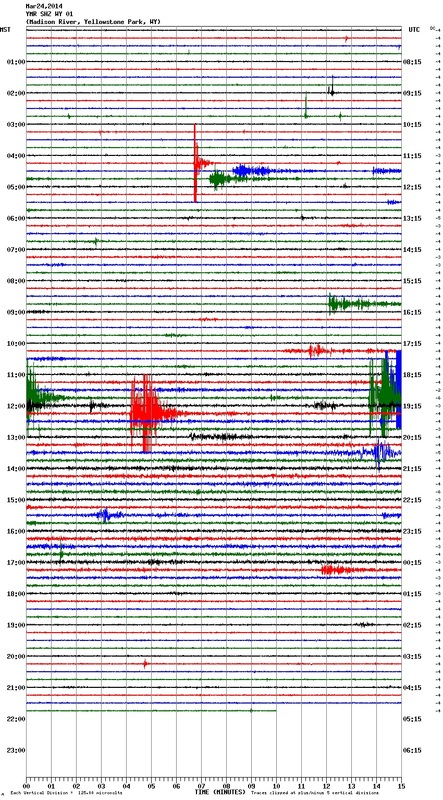 The most important thing to note about the 3 June 2014, Yellowstone is this « magnetic anomaly », the report continues that satellite measurements show that it is precipitated by the swarm of earthquakes that mysterious hit the Brooks mountain Range, Alaska, and seismologists are still looking for explanations. 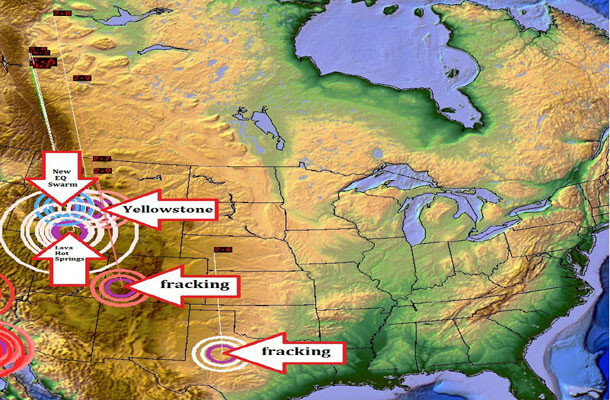 Information on the binding of these two « events » in this report have also been verified by the United States Geological Survey (USGS) maps and data on the magnetic anomalies for North America showing a field magnetic « perturbation / undulation » strange from Brooks Range and ending on June 3 Yellowstone.Le these two areas, it is important to note that Brooks Range is part of the Rocky Mountains that extend more than 4830 km (3000 miles ) in the northern part of British Columbia, in western Canada, to New Mexico in the southwestern United States. « These are serious concerns for the Russian military authorities on these » events « , says General Bondarev‘s report, it was the » catastrophic effect « they had on advanced systems » magnetoception « of inertial navigation used by many US-NATO-Russian war planes that use these sophisticated devices in flight. An important magnetic perturbation is on the road. Although no Russian military aircraft was near the « magnetic disturbed area » from our Yellowstone, June 3, 2014, in this report, two U.S. military aircraft were within their « frontier » in the southern region California, June 4, while this « event » was still « active », making plant floor, both. The two American fighter planes crashed June 4, 2014, the report said. Aircraft have been identified as a U.S. Navy FA-183 crashed while attempting to land aboard the aircraft carrier Carl Vinson, a jet and U.S. Marine AV-8B Harrier crashed in a residential area in Imperial, to the approximately 90 miles east of San Diego, the two accidents in the same hours. The report notes that no civilian aircraft have been hit by this « magnetic anomaly » that the most advanced military aircraft using these systems coordinated flight « geomagnetic planet » that allow them to « kiss the ground » is not without remember magnetic systems used by birds and insects to navigate. 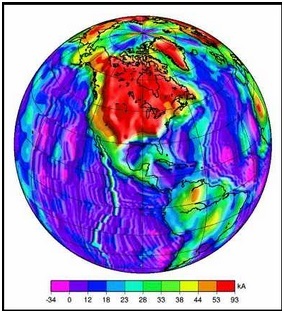 Concerns regarding Russia « magnetic anomalies », it is important to note, are related to the magnetic north pole is moving rapidly since 2005 which was moved at a speed of 40 kilometers (25 miles) per year in the Canadian Arctic to Siberia. A scary independent research last year (2013) also warns that this change is accelerating, and yet according to this researcher is expected to Siberia at least 2 years. « Tampa International Airport was forced to readjust its runways Thursday to account for the movement of magnetic fields of the Earth, information that pilots use to navigate planes. From the fluctuations of the force, the airport closed its primary runway until Jan. 13 to change taxiway signs to account for evolution, says the Federal Aviation Administration. Graph showing the two major seismic epicenters. The American West Coast (San Andreas Fault) Mississippi (San Madre Fault) and to Yellowstone … a great magnetic anomaly has occurred. / Operations fracking search for shale gas might even affect. 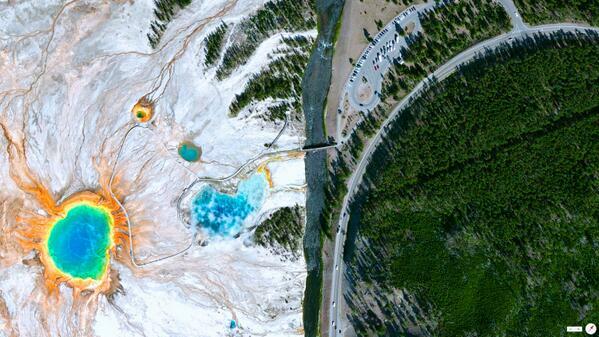 Even capitalism contributes to the eruption of Yellowstone. Brooks Range is at left at the top. View of Firehole Lake from the sky. 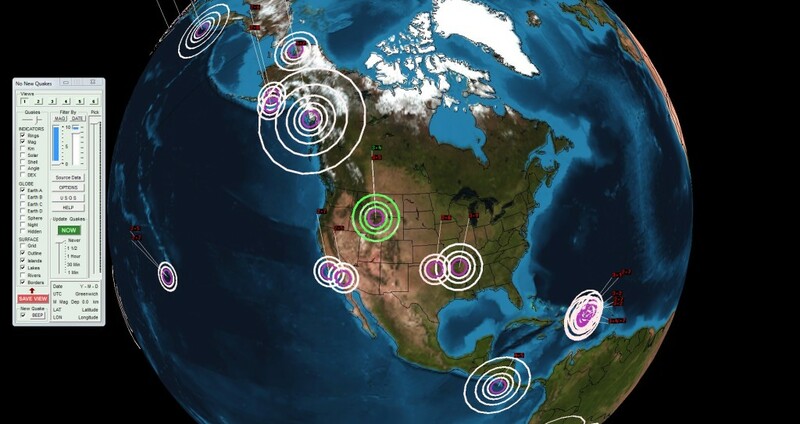 The earthquakes of March 24, 2014. 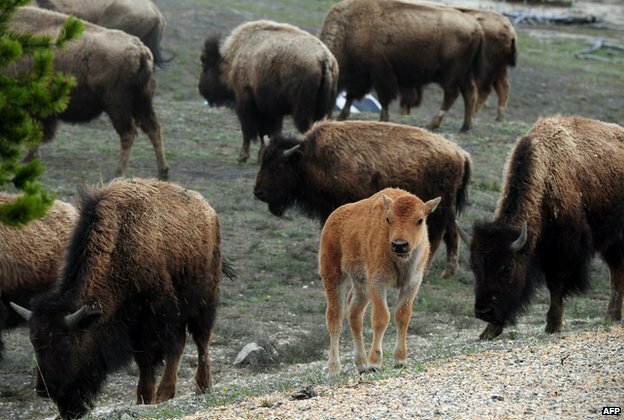 All my thoughts are with these great Bisons Park Yellowstone.Je wants them to live as long as possible. ‹ PrécédentExclusif : Après les chemtrails, les chembombs !